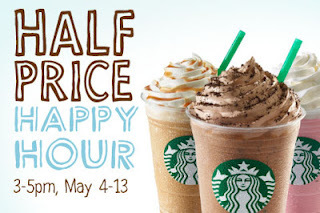 Starting May 4th and lasting through May 13th, Starbucks is offering half-price Frappuccinos from 3:00-5:00 PM, during Frappuccino Happy Hour! No coupon is necessary. Just enjoy Frappuccino Happy Hour at all participating Starbucks! If you’d like daily reminders about this deal so you don’t miss a day, text HAPPY to 697289.